​The Schoolwide Enrichment Model – Technology (SEM:Tech) is an extension of the original Schoolwide Enrichment Model; a talent development model implemented in over 2500 schools across the U.S. and widely used internationally. More than 20 years of research has documented the effectiveness of the SEM approach to schoolwide educational excellence. This solution-oriented update, unlike other books focused on using technology in the classroom, recognizes that digital technologies are changing and evolving at lightening speeds, yet effective skills for learning transcend time. Focusing on the skills that support critical thinking and problem solving, decision-making, and communication, the authors seamlessly merge technology to launch students toward independent productivity. 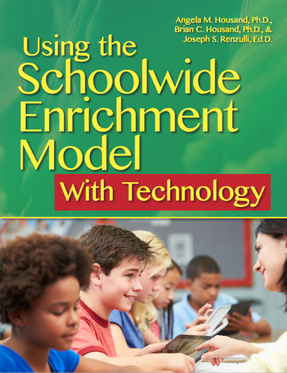 This accessible and transformational guide to using the Schoolwide Enrichment Model with mobile natives is rich with examples that will change the way you think about education while providing a practical “how-to” guide for creating a culture of excellence and innovation in your school and classroom.